Okinawa Prefecture announced that wedding couples in Okinawa in the first half of 2018 were up 12.4% year on year to record-high 7,798, which consisted of 6,825 Japanese couples (+13.7%) and 973 foreigner couples (+4.1%). 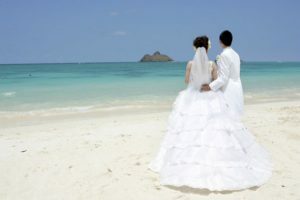 Okinawa Prefecture has been appealing ‘Okinawa Resort Wedding’ since Okinawa Resort Wedding Association was established in 2011, setting a goal of 18,000 couples through 2018. In the overseas market, wedding couples from Hong Kong and Taiwan accounted for 87.2% of the total, and popularity of legal wedding, filing their marriage paper in Japan, has recently been rising. The average number of attendants was 17.6 a wedding by a Japanese couple and 22.7 a wedding by a foreigner wedding. The average local spending was estimated at 73,310 JPY a Japanese attendant and 100,265 JPY a foreigner attendant. Okinawa Prefecture estimated that an half-year economic effect including wedding ceremonies reached about 11 billion JPY in total.